Thirty years ago, Tomás González’ brother Juan and his wife Marie-Elena, bored by the wealthy, partying, intellectual circles of Bogotá, escaped to Colombia’s Caribbean coast and sunk their money into a run-down farm overlooking a deserted beach surrounded by jungle. Their dream of escaping the rat race ended in calamity as spiralling debts, divisive frictions, hard drinking and lurking violence took their toll. As González pieced together the alarming and unforgiving details of their story, he realised he needed to write a fictional account of what happened in order to come to terms with his sadness and anger. 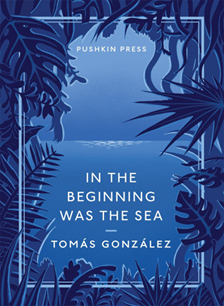 In the Beginning Was the Sea is the result; an unflinching but lyrical exploration of reckless abandon and dark human impulses, now available in English for the first time. MR: You’ve acknowledged the shame you sometimes felt at using painful real-life events to create your first work of fiction. How did you deal with that perplexing process of retrospection, clearsightedness, inspiration and guilt? TG: It was very hard when I was writing it. I had some regrets about using those terrible events to make literature. But after a while, little by little, I understood it was a way of coping with what happened, and that the writing of the book was my way of understanding the tragedy. I started writing it maybe one year after. The first attempt was like a biography, starting with my brother as a kid, but that became too complicated, I started feeling that I wasn’t writing what I wanted to write. Then one day I realised I had to start the story with the bus, with them both in the bus going to the farm, and not to tell anything about his life prior to the trip. In those opening chapters there’s a sense of optimism about their moving to the sea to start a new life, but it’s undermined by the detail of the place where they are dropped, and by their obvious lack of preparation. I did that bus trip two or three times, and always I knew what I was going to find in Turbo, the port city. I always felt happy because I was going to the sea, but I knew it would be a disappointment the first time I saw the water. I last went a month ago. I didn’t go to the farm, I went only to Turbo where they take the onward boat, and it has changed. The buildings are different, it’s difficult to identify some places, but it’s not much better. The water is still dirty, oily, and the smell is about the same. It hasn’t changed a lot. In between times there was guerilla and paramilitary activity in that area, but now it’s calm again. Towards Panama, up north, is beautiful because it’s far from the Atrato River, the big jungle river not far from where my brother had the farm. The river water is chocolate brown and in winter all the beaches are that colour, it’s not pretty. The frontier with Panama is a beautiful, beautiful place. But where my brother had the farm… He was thinking about tourism, but with the problem of the river spitting out the debris of the jungle, tourism would never have a chance. J. and Elena’s idealism is shown to be misguided, and the failures, fights and tragedy to come are foreshadowed from the start, gaining momentum and ferocity as the narrative unfolds. A Chronicle of a Death Foretold came out only a couple of years before your book was first published. Was García Márquez an influence in terms of mood and plotting? And which other writers have influenced you? I think the influence of García Márquez is big on all of us. He started talking about familiar things in his beautiful books, details of flowers, birds in cages, the universe we all in Colombia know very well, and he used all those elements in his masterpieces. So that in itself gave us the confidence to use everyday things in our books. He did it, and we thought we could also try it. It’s not magical realism, and it’s not an invention of García Márquez. It’s a reality of the Caribbean, and he’s just describing what he sees. You can see it also in the Cuban writer Alejo Carpentier. I guess it goes back to Juan Rulfo as well, whose Pedro Páramo García Márquez acknowledged as a particular inspiration. I was thinking about him. The influence of Rulfo is big also with Andean writers, the people high up in the mountains. That Indian sadness, the particular sadness of people not influenced by the Afro-Caribbean culture. The title of the book derives from Kogi cosmology. How much did the Kogi belief system inform your approach to writing this book? In the beginning was the sea. All was in darkness. no plants. The sea was everywhere and everything. The Mother was neither woman, nor thing, nor nothingness. I thought immediately I could use this for my book; that if I could keep the story at this philosophical, poetic level, I would be OK. The narrator is a guardedly critical observer. If he’s got an opinion, he doesn’t put it onto the page, he’s deliberately neutral. But a more cynical and embittered voice interrupts about halfway through. Is this your own anger breaking into the narrative? I became like two people. As I was writing the book, I tried not to have an opinion, to keep it distant and cool, objective. But I was very angry with him, with Juan my brother. I thought it would be good if I put that anger in the book too. I had written a letter very similar in sentiment to my sister-in-law, trying to explain what happened with my brother, and I thought I could put the letter almost in the middle of the book to give the story another perspective and a break in the narrative. Are J.’s move to the sea, his preference for bad art, his dislike of pretension and a taste for cheap liquor all indicators of a kind of anti-intellectualism? Some very contemporary concerns about the natural world also feature in the book – typified by the forced and unsustainable felling of trees on the estate when the money starts to run out. It’s tragic when someone like him who loved the jungle deeply has to destroy it. This was terrible for him, and he started to drink even more after that started to happen, because he felt that everything was going the opposite way from what he had planned. The first publisher of this book was a friend who owned the nightclub in Bogotá where you were working. Was that a very limited run? Not so little, 1,000 copies. Most of them he himself gave away at the bar, person by person. And what happened next? Did it get picked up by a mainstream publisher quite quickly? I moved to Miami and my friend wrote to me telling me the reaction of the people, and a very important writer in Cali wrote a very good review of the book in a newspaper. That was the first one, which of course I was very happy about, but it didn’t have a commercial printing for three or four more years. Were you working on your next novel already at that point? As soon as I went to Miami I started working on my second novel, which was picked up by a publishing house in Bogatá and won a prize. It took two more years before another edition of In the Beginning Was the Sea was published, in Medellín. The city government published it among a collection of writers. Then it was another two years before Norma, a big publishing house, published it commercially in Colombia and other Spanish-language countries. Every time there was a new edition, I read it again and made some small changes. How has Colombian society changed since the book first came out? I don’t see much progress really. The thing is we are in a war, we have the drug trafficking problem that is crippling our country, which is not going to be solved until the drugs are legalised. The economy and the whole country will be crippled until that happens. The guerillas and the paramilitary are now drug traffickers, so the problem has been getting more and more out of control. Corruption is a big problem because there’s so much money around. If the peace talks end well – and they may end well, we could have peace relatively soon – and the drug trafficking problem is solved by legalising drug production, the country is going to change really, really fast. But despite the slow progress so far, you moved back to Colombia in 2002. What drove your decision to go back? It was a personal situation. My first wife was sick, she got MS and the situation in New York was difficult for us because we lived on the fifth floor and she couldn’t walk anymore. Also we had to find a permanent nurse, which was too expensive in the United States, so we were forced to go back to Colombia. But I always wanted to go back, I missed the country a lot since I left it. So you haven’t regretted being back in Colombia? I regret it for Laura because she was so happy in New York, and she was unhappy having to go back to Colombia in those circumstances. But I was very happy to wake up in the morning in the countryside and listen to the sounds of the neighbourhood and Colombian nature. Most of your books were written in the US, since you spent twenty years there. So how did the geographical distance from Colombia shape your writing? Nostalgia for my country, for the sounds of nature, was so strong that I wanted to recreate it when I was writing the novels. In one novel in particular, Los caballitos del diablo, I tried to recreate every detail of a small farm near Envigado, and the sounds and smells I was missing in New York. But then after I returned to Colombia, I started to feel nostalgic about New York. I wrote a novel and several short stories and poems with a New York setting. It goes always a little bit behind what you are living. Which of your other novels do you think we might next see translated into English? It depends on the publishers. They know the English-speaking public, and they have several novels to choose from. I think La luz difícil, the New York novel, is one that Frank Wynne would like to translate, but I don’t know about the publishers. Short stories. I like to write short stories a lot. They are so difficult to write, and I like to learn to write them. I’ve published two collections before. In the first the stories are each 40 pages long, in the second they are real short stories, and now I’m working on a third collection. Is there another novel you also want to tackle? I have some ideas, but they take time to mature, sometimes for years the idea is there and I’ll keep thinking about it until I know how to write it. 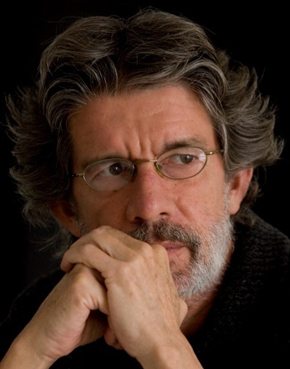 Tomás González was born in 1950 in Medellín, Colombia. In the Beginning Was the Sea was first published in Spanish in 1983. He has since published six more novels and two short-story collections, and his books have been translated into six languages. In the Beginning Was the Sea, translated by Frank Wynne, is published by Pushkin Press. ++ NEWS UPDATE 13 April 2015: In the Beginning Was the Sea is shortlisted for the 2015 Independent Foreign Fiction Prize. Read more.